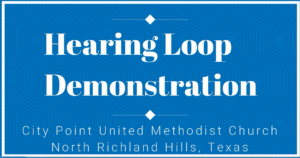 A hearing loop is an assisted listening device used by those with hearing aids and cochlear implants. The hearing loop provides a magnetic, wireless signal that is picked up by the hearing aid when it is set to the Telecoil setting. A loop driver takes a signal from a sound system, television or microphone and transmits the sound through a loop of wire placed around the room. The loop signal provides a clear interference free sound. Anyone with the proper receiver can listen to the audio signal. They are especially useful for the hard of hearing who can switch directly into the system by using the T-coil position on any equipped hearing aid. Hearing loss is a disability that few people understand. According to John Hopkins researchers, one in five Americans over the age of 12 have hearing loss severe enough to make communications difficult. A hearing loop provides significantly enhanced functionality for hearing aids and cochlear implants in numerous venues. Theaters, performing arts centers, churches, auditoriums, Court Rooms, Ticket Counters, Drive Thru windows and TV rooms are just a fraction of the places hearing loops can be installed. 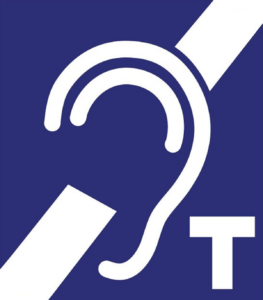 A hearing assistance sign with a ‘T’ lets people know they can activate their telecoil, or t-coil.